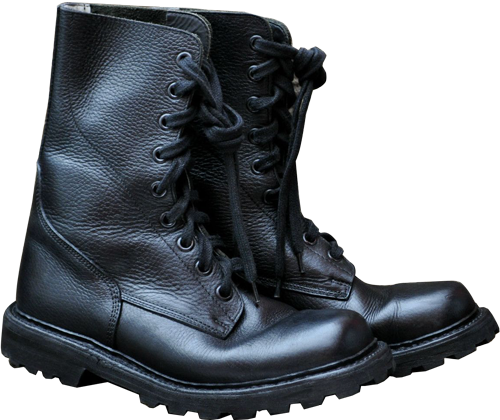 Depending on the boot's size, smaller-size boots have 8 pairs of simple round eyelets, like on the pictures below. There was a kind of ABL combat boots, which look like regular GESKA-RUGAK boots, but they have stitching on the sides. This sewing line goes from the lower bottom side of the lacing eyelets, along the whole bootleg up to the boot's top. This stitching was intended to keep internal leather lining, under which there was foamed rubber (porolon), which acts as a padding to protect the side bones of the feet from injuries. 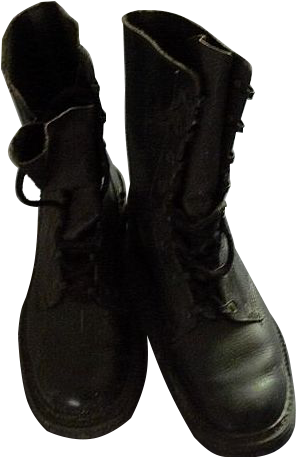 The same line can be seen on the Swiss KS 90 boots (KampfStiefel Modell 1990) and old Bundeswehr boots (Variant 3a: "Genarbtes Leder, Schnurung mit Haken (Grain leather, lace-through boots with hook clamps)), which had been produced from 1984 to 1993. 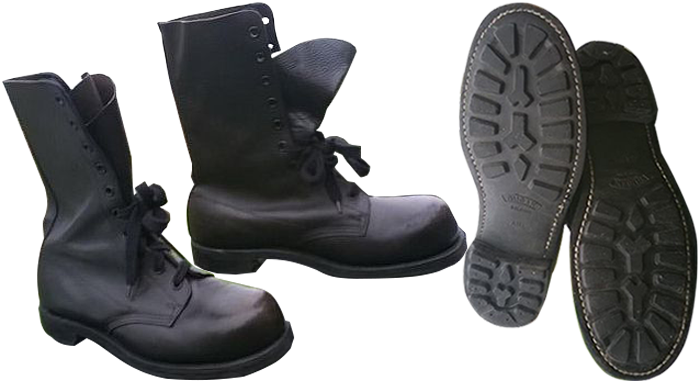 Mr. Johan Geyskens kindly informed the author of this review, that the production of this version of ABL RUGAK boots was started on demand from the Belgian Army command, because they saw the same feature in the aforementioned Bundeswehr boots. After some time these boots with side bones padding appeared to be not so good as it was supposed. The padding became the weak point of this model: after a while the lining used to come in bad condition, the socks began to wear off faster, and there were other problems with feet and the Achilles tendon, mainly because the feet could slide inside the boots while walking. There was also a kind of GESKA-RUGAK safety boots, with steel caps, designed specially for such services as fire-fighters, construction engineers, maintenance and transport personnel, and those, working in garages etc. In some cases such boots featured oil-resistant out-soles. A kind of ABL GESKA-RUGAK boots with quick-lacing system have been produced for commando paratroopers as limited edition series and against the advice of GESKA-RUGAK, because quick lacing system is generally not so reliable and robust as simple round eyelets. According to the GESKA opinion, in case if a quick-lacing system was broken down, the normal lacing process is impossible. More-over, quick-lacing system can be very dangerous for commando troopers during jumping out of plane. The cords of parachute can inter-mesh with the quick-lacing system rivets, that is definitely against safety requirements. So after a while GESKA-RUGAK stopped production of this ABL boots with quick-lacing system. By GESKA-RUGAK experience, all the changes of the ABL boots concept used to arise with every next Minister of National Defense, who wanted to try something new, accept some ideas from the neighbor armies, and make some changes, but having no experience in this field. So after such attempts of integrating some novelties they had to return back to the original classic ABL model, because the experienced footwear manufacturers are much better experts and professionals in this field. 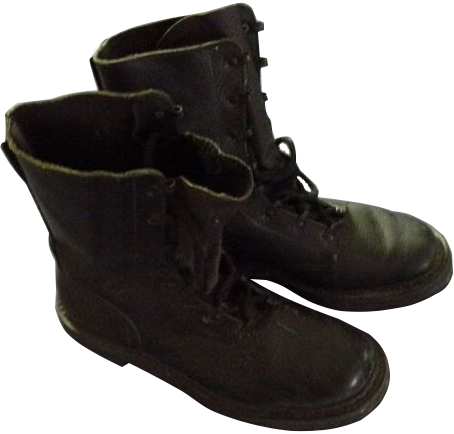 The famous "Geska-Rugak" ABL combat boots represented by themselves the advanced out-soles, created by the family’s technological secrets, and the "know-how" upper leather, which was created and implemented after many years of experience and field tests, performed by the family members themselves.